Currently in the information age, we must constantly evaluate various web technology and make decisions as to which to use, which to eliminate and which to aim for. Therefore, it is crucial to keep up-to-date and gain a general understanding of the current habits of web developers. Java Web Framework ZK has conducted a community survey that seeks to answer several key questions. According to the results, a substantial number of developers, approximately 45%, have upgraded to JDK 8; however, over 50% of participants are still working with previous versions. Although the common perception is that IntelliJ has become more popular due to superior efficiency, it appears that Eclipse still remains the majority’s preferred mode of web development. 75% of survey participants continue to rely on Eclipse, while a considerably lower number, at 19%, are currently developing with IntelliJ. Since January 2016, Microsoft has stopped supporting IE8, 9 and 10. Correspondingly, our results indicate that one-third of developers have upgraded to IE11. However, it is important to note that the majority, at 51%, aims to continue supporting IE8, 9, 10. A small percentage of developers (11%) are unaffected by this change, as they are not planning on incorporating IE into their projects. 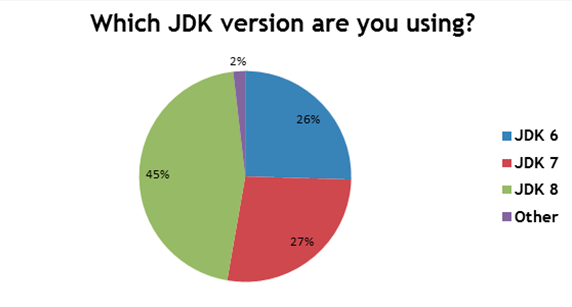 45% of developers are using JDK 8. 75% of developers work with Eclipse. 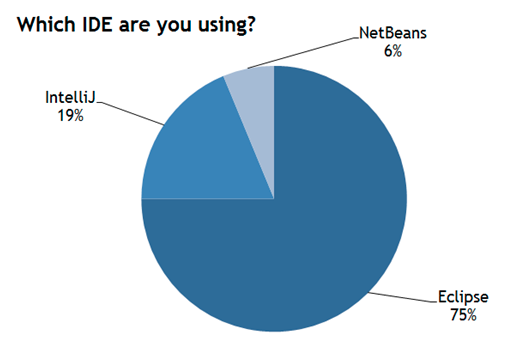 19% of developers currently use IntelliJ and 6% use Netbeans. 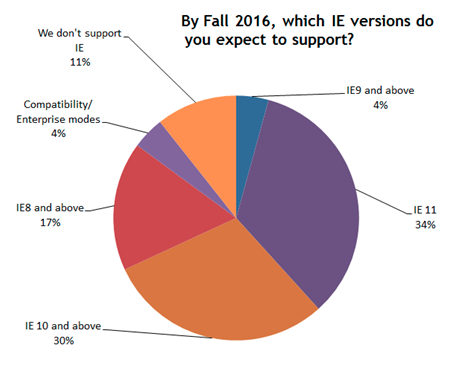 By Fall 2016, 32% of developers expect to support IE11 and 30% expect to support IE10 and above. 21% of developers will likely support IE9, while 11% are not planning on supporting IE at all.